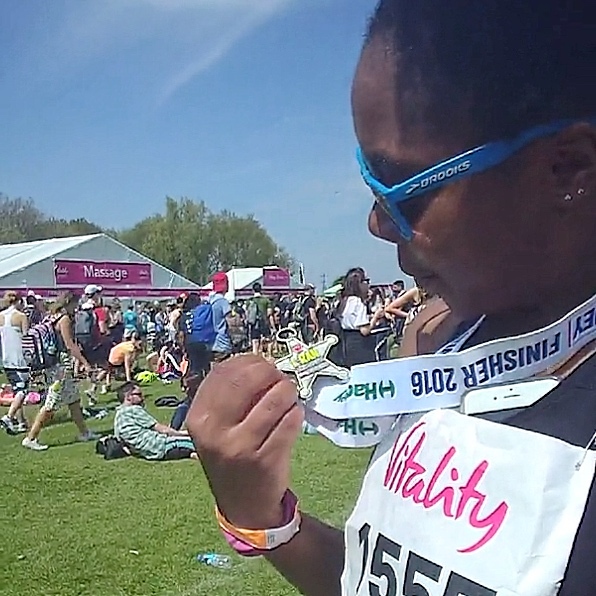 For the third year in a row, I ran the Hackney Half Marathon. If there is one thing that is evident, it’s that this race is cursed with hot weather. Hot weather that hasn’t graced us with it’s presence for training, so come race day when it’s 27 degrees, we can’t really cope. After running the 5km on the Saturday, I made a last minute kit bag swap for shorts and a sports bra. Last year, I spent half the race faffing about with my top, then decided to take it off so I thought I’d just skip one this year seen as I knew it was gonna be hot. This particular sports bra has pockets on the front which are perfect for stashing my shotbloks, nuun hydration tablets and mobile phone. I also took along a bottle of water with me in this cute Swell Bottle which keeps your water cold for something like 12 hours! Do you know how good a cold sip of water tastes after running for two and half hours in the heat?! Running Tip: pack vaseline to rub on areas prone to chaffing! #ouch …or like I learned (thanks to Bethan), St John’s Ambulance staff have a stash on them and they seemed to be located close to all the water stations! My new morning routine for a short while now has been to drink a glass of water before I do anything else and race morning was no exception. After my water, I had some Pimped Up Overnight Oats for fuel – I mean, I was gonna be running for over 2 hours! Running Tip: Don’t forget to pop on your suncream before you head out! While you’re making or eating your breakfast is a great opportunity! There were 7 water stations situated on the course and I told myself I would just drink at the ones I needed to. This totalled all 7 and even some Lucozade from one of their stations! 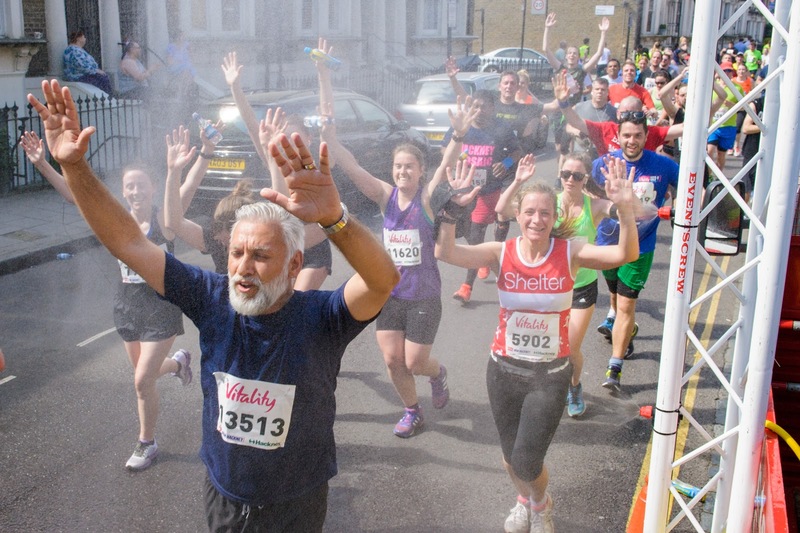 I have also never been so grateful for people with hoses in their front gardens dousing us (as the ones provided by the race really, really didn’t do anything regardless of how good the next photo looks!). There were also some spectators / locals handing out cups of water so in fact that was 8.5 stations for me during the race! I was lucky enough to run with Bethan (of A Pretty Place To Play) and our friend Kiera. From day dot (well at least on the day! lol), we decided it would be our once regular #PartyPace … a mix of chatting, laughing, catching up and no GPS. Coming through the finish line, I was so focused on getting my medal, I missed the bananas. But the goody bag had a few treats in it which helped to stave off my hunger for a little while longer. Talking of the medal, can you see how unimpressed I am?! This. This is my bling shot, cos you don’t wanna see it too close up, believe me! How do you cope running in hot weather? !